Slo-Mo is the brainchild of Philadelphia steel guitarist Mike “Slo-Mo” Brenner. Brenner has recorded and played on the road with such artists as Badly Drawn Boy, Magnolia Electric Company, Marah, Melody Gardot, G Love and more, but Slo-Mo is something totally different. 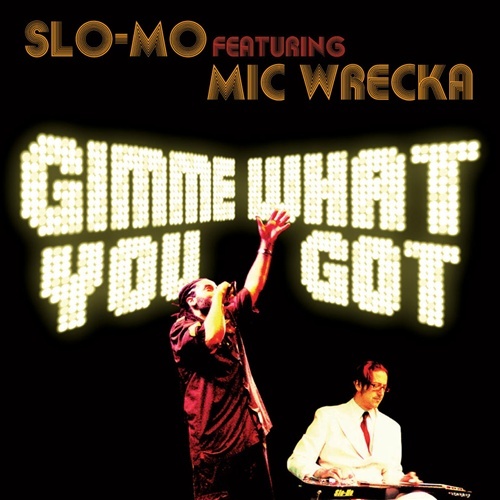 Mixing Brenner’s steel guitar grooves with frontman Mic Wrecka’s rhymes and hip hop poetry, Slo-Mo Featuring Mic Wrecka has become a Philly favorite, winning over fans with a slamming live show and uniquely funky tunes backed by a tight 8-piece band. Slo-Mo’s first disc, Novelty,(Bong Load, 2000) was produced by Tom Rothrock (Beck, Foo Fighters, James Blunt) and Beale Dabbs (R.L. Burnside, Lutefisk) and combined electronic beats and samples with Brenner’s dobro playing. 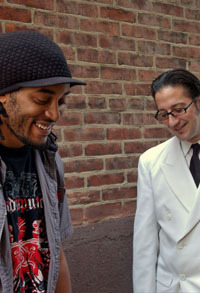 The follow-up was My Buzz Comes Back,(PHIdelity, 2005) the first disc to feature Mic Wrecka as a collaborator. The Brenner/Wrecka co-written songs “My Buzz Comes Back” and “Shackamaxon” received heavy airplay from Philly station WXPN and the band, now augmented by singers Susan Rosetti and Steph Hayes (of Philly’s Stargazer Lily), set to work impressing audiences with their highly energetic live gigs. The next disc Smokey Mountain (PHIdelity, 2007) continued the evolution of the band and further established Mic Wrecka as the frontman and main lyricist. Songs such as “Shine As You Are” and “Aramingo Takeout “immediately became live show staples. With their newest, Gimme What You Got, (Authentic Records, 2009) the band has created a disc that matches the excitement of their lives shows as well as showcasing the increased confidence of the unit itself. With the addition of keyboardist Daryl Hirsch, the line-up has solidified and bloomed into a band that consistently delivers the goods, night after night.